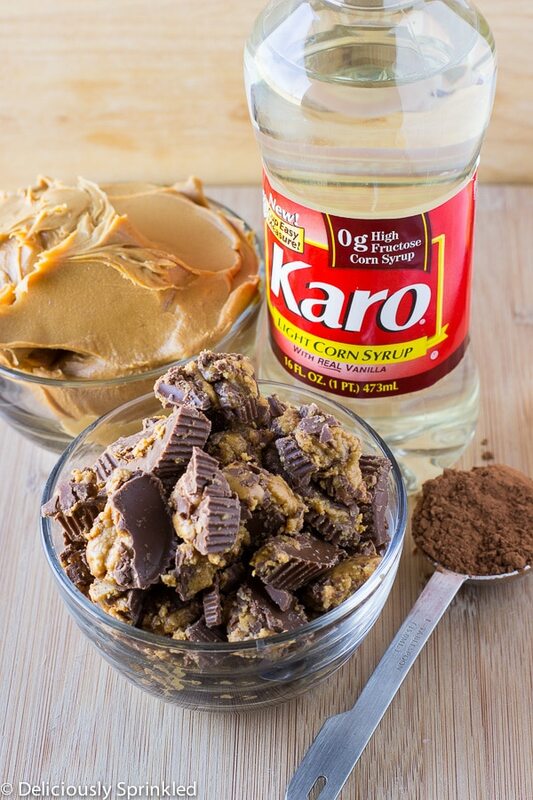 This recipe for Chocolate Peanut Butter Whoopie Pies is brought to you by Karo® Syrup. These Chocolate Peanut Butter Whoopie Pies take the classic whoopie pie to a whole new level. 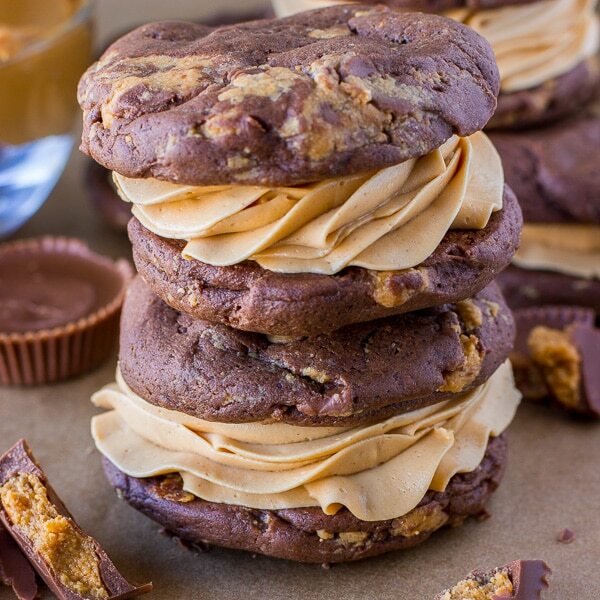 Since we all know that chocolate and peanut butter is one of the best combos ever, I knew that layering these whoopie pies with a delicious peanut butter filling and stuffing the cake-like chocolate cookie with peanut butter cups would definitely be a hit! And I was right. These amazing little pies disappeared so fast and they were super easy to make. If you can make a batch of cookies, you can make these delicious whoopie pies. o fancy baking tools needed. You simply mix up the batter, which I used Karo® Light Corn Syrup in the batter, and I think that’s what makes these whoopie pies so good. Then just bake them up, let them cool, and fill them with the amazing peanut butter filling. Easy peasy! With Mother’s Day right around the corner, and my mom being a chocolate and peanut butter lover, I think these whoopie pies will be included in my mom’s Mother’s Day gift this year. ✔ I used 16 regular sized peanut butter cups to mix into the chocolate whoopie pie batter. To make it easy to crush them, I placed the 16 peanut butter cups into a large ziplock bag and used a rolling pin to crush up the peanut butter cups. ✔ I also recommend using CREAMY peanut butter for the filling. If you use CHUNKY peanut butter, I find that the filling doesn’t have enough “peanut butter” taste that creamy peanut butter gives the filling. ✔ After assembling the whoopie pies, place them in the fridge for about 5-10 minutes to let the peanut butter filling set before enjoying! Preheat oven to 325F degrees. Line one large baking sheets with parchment paper or silicone baking mats. Set aside. Whisk flour, cocoa powder, baking powder, baking soda and salt in a small bowl. Set aside. Using a hand or stand mixer, beat butter, granulated sugar, brown sugar and eggs in a large mixing bowl for 2-3 minutes until thick and combined. In a small bowl, mix together milk, corn syrup and vanilla extract until combined. Add cocoa mixture to butter mixture, alternating with milk mixture, beating after each addition until smooth. Fold in chocolate peanut butter cups until combined. Scoop batter (about 3 tablespoons each) onto prepared baking sheet. Slightly, flatten batter with fingers. Bake for 10-14 minutes. Let cool completely on wire rack. Using a hand or stand mixer, cream together butter and creamy peanut butter until light and fluffy. Beat for about 3 minutes. Slowly, add powdered sugar and vanilla extract. Mix until filling becomes light and fluffy. Spread or pipe filling on the bottoms of half of the pies; top with remaining pies. This is a sponsored post in partnership with ACH Food. I’m thrilled to be partnering with them as a Become A Better Baker ambassador to share some of my favorite baking recipes. All opinions are my own as always. Thanks for supporting the brands that help make Deliciously Sprinkled possible! If I make them the day before, do I need to refrigerate or just keep them in an air tight container? Yes, I would keep them in the fridge. Couldn’t agree more….chocolate and peanut butter is the best combo! These look so chocolatey….and peanut buttery….and DANGEROUS! Seriously!!! Oh wow! I am making these as soon as possible. I am sharing these. These whooopie pies look great! I love anything peanut butter and chocolate….soooooo good! I’m loving all the peanut butter action in this recipe. I’m going to need at least two. Pinned. OH-M-Gee! These look insanely good. I seriously just drooled on my keyboard! 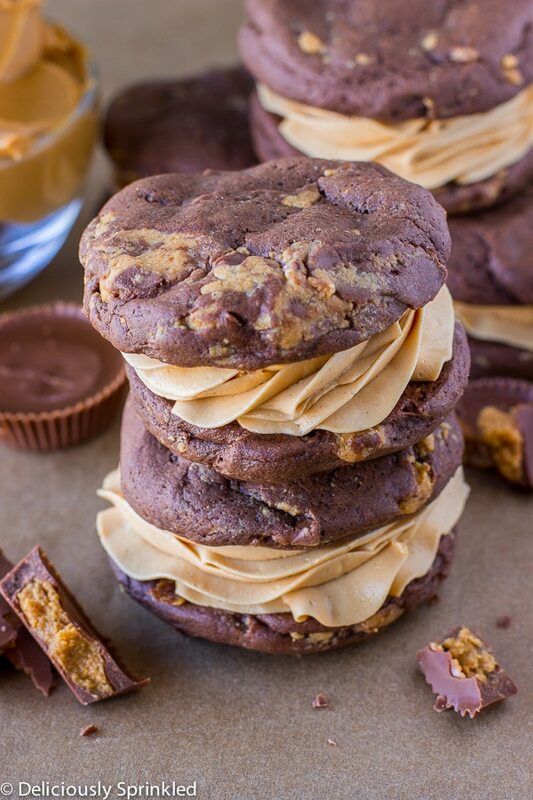 I love peanut butter and chocolate anything so these cookies are definitely a hit for me. They remind me of Bouchon bakery nutter butters (which I LOVE). Holy moly, these look a-m-a-z-i-n-g! Wish I was eating one now! OMG, where were these last week when I needed an idea for my dad’s birthday?! Haha, I will just have to make them for fun now, no excuses needed! Oh these would be a hit around here. They’d last maybe a minute. Whenever I’m in Maine, I have to stop at Wicked Whoopies in Freeport for my fix of Whoopie Pies. 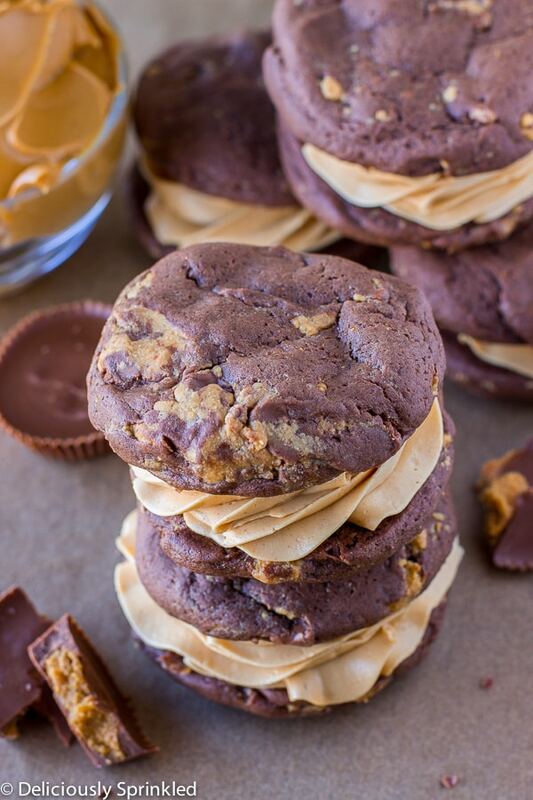 These look amazing and like a recipe that any peanut butter and chocolate lover would adore. Thank you for sharing.